Hikers of all ability levels come to Grand Canyon to challenge themselves. Whether you’re a seasoned ultrarunner preparing for a rim-to-rim or an inexperienced hiker conquering the first few switchbacks of the Bright Angel Trail, Grand Canyon offers an adventure that will take your breath away — literally. 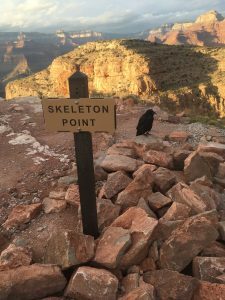 This blog post is about Skeleton Point, a challenging but very reachable destination on the South Kaibab Trail that offers hikers a glimpse and whisper of the Colorado River. The hike is six miles roundtrip and includes over 3,500 feet of elevation loss and gain. Make sure you have plenty of snacks and water before setting off on any hike! I brought four liters of water and about 1,000 calories the last time I went down to Skeleton Point. Do not attempt this hike unless you are familiar with hiking moderate mileage and know what your body requires. The trail’s first landmark is Ooh Aah Point, which you will come across one mile in. The next landmark before Skeleton Point is Cedar Ridge, which offers a conveniently located trail toilet. They say the South Kaibab is the steepest and most exposed of the South Rim’s corridor trails, but there are actually two or three relatively level stretches leading down to Skeleton Point. Once you see the sign for Skeleton Point, hop off the regular trail, which spirals down to the right. Instead walk a few feet to the left, where you will find the promised view of the Colorado River. Ask your friends to be quiet and turn your headphones off here: the turbulent river is usually audible from this location as well. Skeleton Point is the perfect place to watch the sunset or enjoy a picnic. Just make sure you have a headlamp if you plan to hike back up after dark! As with all hikes in the canyon, they say it’s only three miles down but an entire three miles back up! 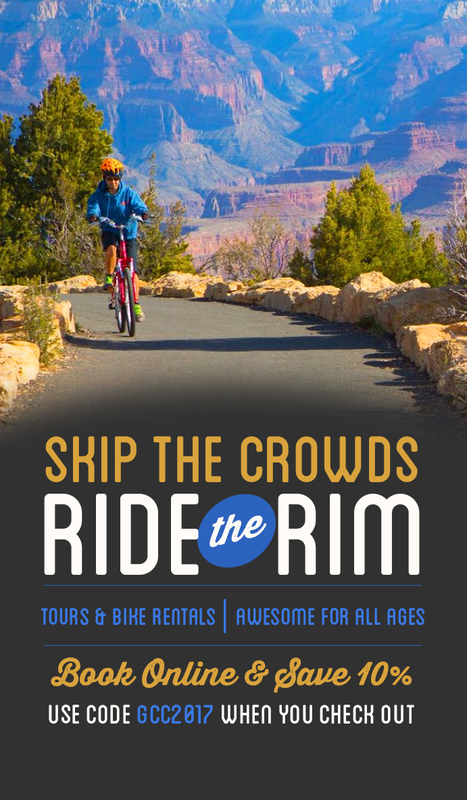 This Website is Owned and Operated by Bright Angel Bicycles & Cafe | To contact the moderators, please contact BAB directly at www.bikegrandcanyon.com | Please note that you will visit the places mentioned in this blog, or you participate in activities described, that you do so AT YOUR OWN RISK! You should always consider nature a formidable force, and take all measures of safety necessary for safe travel and also mindfully conserve the wilderness that you are visiting for future visitors.